Last year at SCC Sechs volt had a prize called "Sechs volt spirit 2008". The prize is ment for a true Sechs volt-car with attitude and most possible untouched in modern times. Isak Syvehuset got the price last year for his nice split. 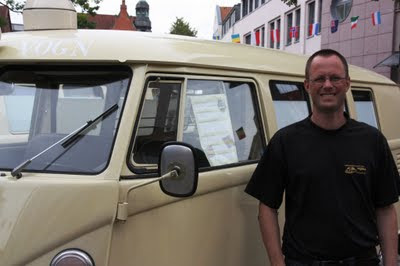 We met him again this summer in Hessich Oldendorf with his very nice ambulance. He is working at the hospital so that makes sence to own a such car. Isak will attend this years SCC as well.